How much is Candace Parker Worth? Candace Parker net worth and salary: Candace Parker is an All-American Basketball player for the Los Angeles Sparks of the WNBA and for the UMMC Ekaterinburg of Russia and has a net worth of $2 million. Candace Parker has earned her net worth through her career in professional basketball. In 2008 Parker was chosen by the Los Angeles Sparks in the WNBA Draft and in her very first game, she scored 34 points, 12 rebounds and 8 assists against Phoenix Mercury, breaking the rookie record for a first game played. For the months of May and July in 2008 she earned the name of Hanns-G 'Go Beyond' rookie of the month. Parker also was awarded the Hann's-G Rookie of the year and MVP for the 2008 season. She entered the 2008 Summer Olympics with U.S. National Women's Basketball team and won the gold medal. In 2011 Parker suffered a knee injury and had to set out the rest of the season. She has been selected, along with 20 other women, by the U.S.A Basketball Women's National Team Player Selection Committee to compete in the 2012 Olympics in London, representing the United States. 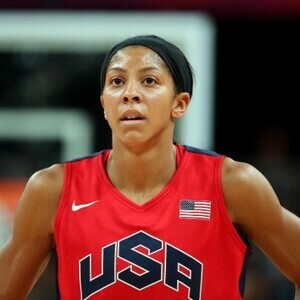 Candace Parker was born in St. Louis, Missouri in 1986 and was raised in Naperville, Illinois. She has two brothers, Anthony (an NBA player) and Marcus (a doctor.) She attended Naperville Central High School in Naperville. During her high school football career she led her team to Class AA state titles in 2003 and 2004. She won several awards during her high school football career such as USA Player of the Year, Naismith and Gatorade Awards and as consensus pick as Illinois's player of the year. She later attended the University of Tennessee and played for the Tennessee Lady Vols. She was named the Southeastern Conference Player of the Year, 2007 SEC Player of the Year and was awarded the Most Outstanding Player honor. In 2008 she married Shelden Williams (basketball player for the Brooklyn Nets.) They have a daughter, Lailaa Nicole Williams, born in 2009.